Apple iPhone 5S is officially the new flagship of Apple. The great event hold by the company yesterday introduced to the mobile world two significant new models, the iPhone 5S and the plastic iPhone 5C. The big night was the culmination of numerous rumors, predictions and speculations that were building up the excitement prior the announcement of the handsets. Big part of the mystery around the devices was slowly unveiled and step-by-step drew a clear picture of what the two smartphones will be like. However a lot of the most interesting features and advantages of the devices remained a secret until the official announcement. The leaks with specs for iPhone 5S revealed that the smartphone will work with A7 chipset. What we didn’t know was that the new processor by Apple will have a 64-bit architecture. This improvement in the CPU is the first ever integrated in a smartphone. Why did Apple choose this type of processor? The company introduced us to the advantages of the 64-bit CPU dressed in technical terms. It will work with an updated introduction set. The new CPU will assure 2x general-purpose registers and 2x floating-point registers. It will provide over 1 billion transistors and 102mm2 die size. 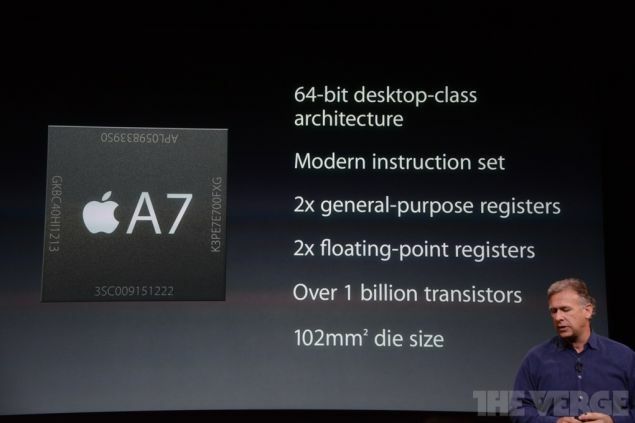 If all this makes sense to you, it means you already know how great the A7 CPU with 64-bit really is. For the rest of us, the more simple explanation reveals that the new processor will provide 56x faster GPU and 40x faster CPU performances compared to the last year’s flagship. The numbers seem phenomenal, which makes the impatience to try the new device in real, even bigger. As expected, Apple has been working hard on developing software that can support and unleash the potential of the 64-bit CPU. iPhone 5S runs on the new iOS 7 that has everything needed to assure the perfect performance of the device with abundance of features.